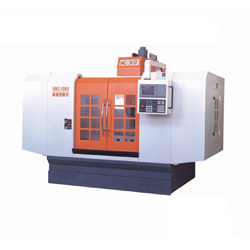 Manufacturer of CNC Machinery & Equipments. 2. Taiwan C3 grade sealed ball, leading screw, spindle lineal way. 3. Every machine is checked by Renishaw laser and ball bar. 4. Control system: Fanuc, Mitsubishi. 6. X, Y axis lineal ways. 7. The fourth axis is optional. 8. 20pcs tool magazine is optional. 1. Table size: 1300 x 600mm. 2. Travel: 1000 x 590 x 600mm. 3. Distance from spindle to table: 100 - 655mm. 4. Distance from spindle center to column: 655mm. 5. Rotation speed: 12000/ 15000RPM. 6. Taper: BT40. 7. Motor: 7.5/ 11kW. 8. Rapid feed for X, Y and Z axis: 24m/ min, 24m/ min, 12m/ min. 9. Cutting feed: 8m/ min. 10. Positioning accuracy: 0.008mm. 11. Repeating accuracy: 0.005mm. 12. Load of table: 800kg. 13. Diemension: 2750 x 3100 x 2700mm. 14. Net weight: 5500kg.